Last night my men put a moratorium on sad (WWI) war movies. Ain’t gonna study war no more! In the all-or-nothing mentality that marinates in the marrow of all those born with my maiden name, I have had my guys watch a dozen movies on the Great War with me. (psst – don’t mention it, but there are seven more in my queue – there is a delete button, I guess) This 2007 BBC movie of a screen play written by David Haig is a top notch movie that will surely make you cry. There is not a happy ending, my friend. Daniel Radcliffe plays young John “Jack” Kipling, a young man whose desire to go to war is thwarted by his extreme nearsightedness. 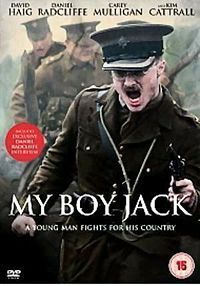 His father uses his influence to get Jack into the Irish Guards. The arc of this movie about Rudyard Kipling and his family is similar to the arc in the story of C.S. Lewis in Shadowlands. A strong speaker with large audiences makes bold, booming declarative statements. Life intervenes; by the end of story you see a profoundly changed man struggling with his private grief. David Haig, who wrote the screenplay and played Kipling, looks uncannily like Rudyard Kipling. Part of the movie was filmed at Bateman’s, Kiplings estate in Sussex. I need to learn more about Kipling. He’s considered controversial these days, especially his poem “The White Man’s Burden.” His astonishing ability to tell stories is framed well in this movie. But he was indubitably an British imperialist, a man of his time. Here is his poem, My Boy Jack. This entry was posted in Uncategorized and tagged poetry, WW1 by alivingpencil. Bookmark the permalink. I watched this when it first came out on PBS. As usual I was not disappointed. Extremely tender and well done, the culture of the time seemed to be portrayed well, the attitudes of those young British men so eagar to go and do their duty, the gung ho’dness’ of their country. I did have to wipe a tear or two away as it was so sad, even though I knew the outcome, and I didn’t think the sadness was limited Jack’s death, the anguish his family felt and the changes Rudyard went through dealing with his guilt and understanding how truly terrible war is, nothing glorious is in it at all, it was all so tenderly done and I’m a crier any way! It’s nice to see both these actors out of their ‘normal’ areas and see what fine jobs they can do in completely different subject matters. @nnjmom – Carrie, I would recommend PBS’ The Great War which I believe is only out on VHS. We had it at our library. It has a Burns-ish feel to it. @applechexx – you said it well – tender. Kipling’s character drew out all sorts of emotion in me: admiration, exasperation, frustration, etc. At times I wanted to slap him, but by the end I just wanted to hug him. So very sad. @Sherry – Sherry, I don’t know but the book sounds very much like the plot line of the movie. One snippet I read – somewhere – indicated that the play and movie have been in the works for 22 years. It looks like the book was published in 2005. I guess David Haig, the writer and actor who played Kipling, was given a biography of Kipling many years ago. He said it was like looking into the mirror (they could pass for twins) and stimulated his growing interest in Rudyard Kipling. @Jbbs_Musings – Thanks for the link!